Fan Base in a familiar spot — the winner’s circle (photo courtesy of Jennifer Young). Fan Base, a 16-hand high bay gelding with a fondness for the turf, was recently retired after making 75 career starts. The son of Hat Trick (JPN) found the winner’s circle 18 times and placed second nine times, all of which were on the turf. Of his 10 third-place finishes, all but one were also over a turf course. Jennifer Young with Fan Base (photo courtesy of Jennifer Young). There may not have been anyone more familiar with Fan Base than his assistant trainer and exercise rider, Jennifer Young, who worked with him during 36 of his starts, including the last 27. The two were first acquainted after trainer Marcus Vitali claimed the gelding as a five-year-old. 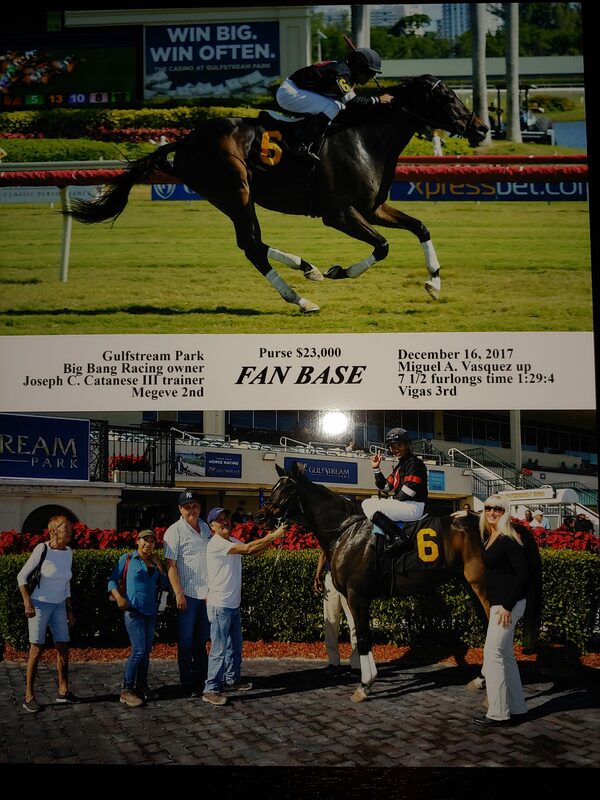 Fan Base won four times while in the Vitali barn — once at Monmouth Park and, then, three consecutive times at Gulfstream Park and Gulfstream Park West — with Orlando Bocachica in the irons for each victory. He was claimed out of the race in which he scored his third consecutive victory for Vitali by trainer Patricia Farro. Fan Base would be claimed several more times after being claimed from Vitali, passing through the barns of Efren Loza Jr., Aubrey Maragh, Jorge Navarro, Ramon Moya and Marcial Navarro, before ending up with his final trainer, Joseph Catanese, where he would also reunite with Young. However, it was through a propitious set of circumstances, with all of the planets being aligned, that the rider and horse would be reunited. “Ironically, a friend of mine that I knew from hockey, his dad had been a part-time racehorse owner in Chicago,” said Young. 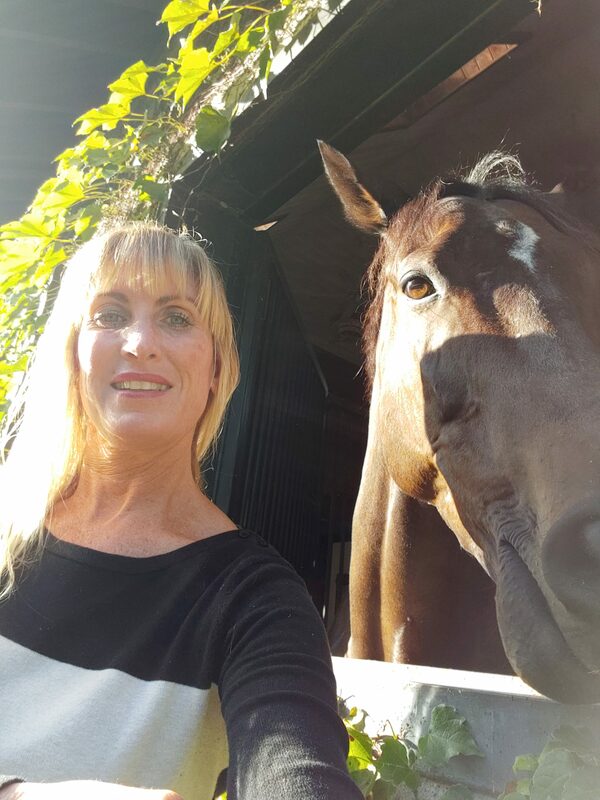 “He said, ‘You have to talk to my dad because he enjoys racing and owns horses sometimes, on and off.’ I met his dad, and he decided he wanted to have horses again. Big Bang Racing gave Catanese and Young a list of two or three horses that they might interested in claiming, and asked if Joe had seen any of them, as he clocks horses in the afternoon for claiming purposes. One of the horses happened to be Fan Base. The veteran campaigner, who raced into his nine-year-old season, had time off at various stages in his career, but would score wins through his final season, including a record-setting performance on the Gulfstream Park turf at 7 1/2 furlongs on Dec. 16, 2017. Fan Base’s personality and demeanor have remained a constant throughout his career too, a characteristic that has endeared the horse to those who know him best — the gelding exudes confidence. The gelding even developed a following among some of Gulfstream Park’s more renowned personalities. Gulfstream Park’s track announcer, Pete Aiello, who called Fan Base’s name many times throughout his career, wished him happy retirement. So did Gulfstream Park reporter and analyst, Acacia Courtney. The track-record-setter’s distinct personality, professionalism and supreme confidence set him apart from other horses. Fan Base was very secure in the knowledge of who he was, according to Young. Fan Base’s equanimity and confidence allows him to adjust to almost any situation. When Hurricane Irma came through Florida in September 2017, the gelding acclimated to the conditions without missing a beat. The impending storm created a chaotic atmosphere, and arrangements were made by a number of horsemen to ship their horses to other facilities that were anticipated to not be as heavily impacted by the storm. Fan Base playing in the water with Jennifer Young (photo courtesy of Jennifer Young). During this time, Catanese calculated his risks and moved into one of the newer concrete barns on the Gulfstream Park backside (Ralph Nicks’ barn). The second day after the storm, the racing stable decided to get the horses out of the barn. Fan Base was in a playful mood, enjoying the opportunity to stretch his legs while grazing. He even dragged Young over a puddle, splashed and played in it, eventually even rolling in it, getting caked in mud from head to toe. The following day Young tacked Fan Base up to ride him because of his professionalism and his ability to take things in stride. Their ride brought some humor to a situation that had been extremely tense just days before. Given that Fan Base is an athletic horse with a competitive spirit, Young, a former three-day eventer, recognized the gelding would be suited for another discipline when he retired, having ridden him routinely for a substantial period of time. The gelding’s last few performances on the racetrack suggested that Fan Base didn’t have the same zeal that was long a hallmark associated with his character, suggesting it might be time for him to engage in another type of activity. “Fanny” with Babette Lenna (photo courtesy of Babette Lenna). 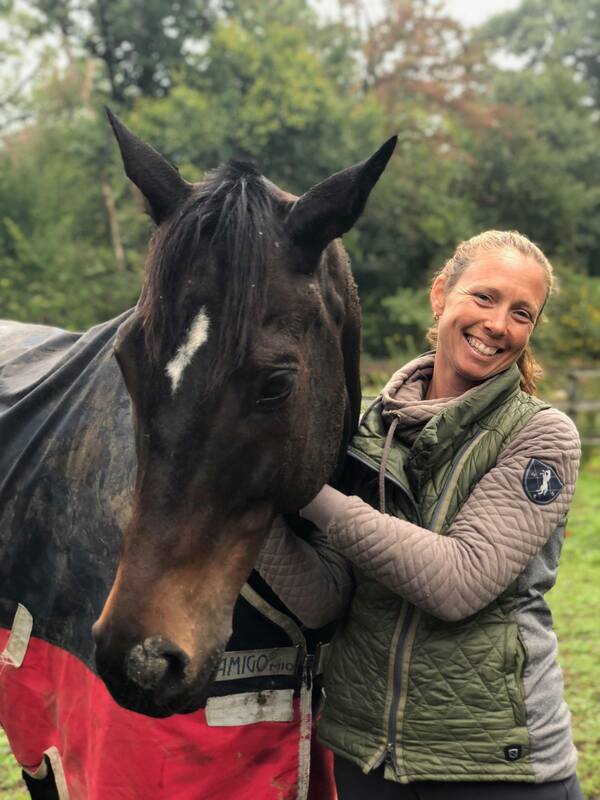 Fan Base is now in Hamilton, Massachusetts, at upper-level eventer Babette Lenna’s farm, a place where Young felt the off-track thoroughbred would prosper and successfully make the transition to his new career away from the track. Lenna does a lot of work with off -track thoroughbreds at various stages of their life. She allows them to acclimate to their new environment by providing them with the opportunity to settle and understand that they will be transitioning into a different routine. That process takes about a month. Fan Base, who Young referred to as “Fanny”, will keep his barn name, said Lenna. Fan Base is acclimating well and the transition process has been seamless, due, in part, to the attributes he possesses. Lenna has started working Fan Base under saddle and recognizes his athletic ability and his potential to make the necessary adjustments to be a solid eventing horse. Lenna does a lot of work on the ground with horses, including trotting them over poles and jumps, to see how they respond and pick up their feet. Lenna is in the process of figuring out the way Fan Base thinks with a rider on him as he approaches and jumps over fences. She’ll take Fan Base to Aiken, South Carolina this winter where he’ll get more of a steady diet of competition. From there, they will close out the eventing season in New England. “My guess is we’ll start him out going beginner novice, just doing his thing,” said Lenna. “Nothing is going to overwhelm him. We’re just getting him stronger and getting him to figure out his new job. He has that sense of, ‘I got it’. Lenna relishes the opportunity to work with thoroughbreds because they’re like no other breed.